Here are ten Wildlife Espionage gadgets for dad on Father's day. Not only are the fun for dad, they are a great way to interact with kids. Many of these are the tools I use professionally as a naturalist. There's nothing quite as cool as covert surveillance. I was tempted to put night vision goggles on this list and by all means if you have the money go for it but good quality night vision is very expensive. A much cheaper alternative is a game trail camera. Just a few years ago even a basic camera cost $250 or more and they all used film. The film cost money to buy and to develop and was often a waste if you discover you had the camera set up wrong. Now with digital camera technology so cheap, a quality camera can be bought for far less and aside from batteries the cameras cost nothing to operate. This is the model we use at work. It can even be set to shoot short videos. This one has laser aiming as well which is a really nice feature. For the price ($275), the Nikon Monarch 8x42 binoculars are some of the best I've looked through. They offer incredible crispness that you often have to pay far more to obtain. If dad likes to watch birds or other wildlife, he'll be blown away when he puts these up to his eyes. That $25 pair of binoculars won't ever be picked up again. They work great for sporting events as well. Here's a real budget conscious idea. A Berlese Funnel is for studying animals that live in leaf litter. One can be made with the extra large funnel pictured to the left. Leaf litter from the forest floor is placed into the funnels and then a very bright light is placed above the funnel top. The bottom of the funnel is placed in a collecting jar of some kind. Often the jar is filled with alcohol to kill the insects that fall inside. Insects move away from the light and heat of the lamp. They also move down as the leaf litter dries out. Ideally, the funnel should be lined with hardware cloth to keep debris other than insects from falling down into the jar. It may take several days for the contents of the funnel to completely dry out and all of the critters to fall into the jar. Museums use a 70% ethanol solution to preserve specimens. Hear more in the woods! This can especially be useful as our hearing becomes less sensitive as we age. Kids may hear sounds adults do not. Learning bird calls is one of the best ways to locate them in the wild. With a little help, you can hear even more in the woods. This device even attaches to many binoculars. 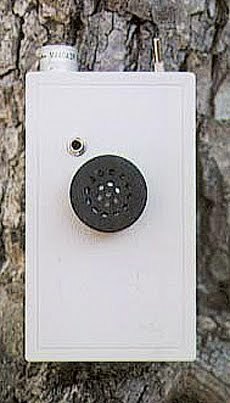 With a recording device it can even be used to record animal calls you don't know so you can bring them back home to analyze. If you add a parabolic dish you can hear even more. A simple (albeit a bit heavy) dish can be made by converting a small old Satellite TV dish. If you are into birds you can watch what happens in their nests from inside your home. Cornell runs an entire website devoted to nest cams people have set up around the country. You can live stream video to your computer from hundreds of nests. If you're really ambitious, you can set up your own nest camera with home surveillance equipment. The SONY CCTV camera pictured to the left is similar to what we use at the nature center where I work. It comes with Infrared LEDs that light up the nest at night so you can see inside even in the dark. This package even comes with the power cord and the cables so it is a good value. This will get the signal to a TV. Streaming the signal online is a completely different matter and will be the subject of a future post. Not everything has to be expensive. Another budget friendly idea is a dip net. Dipnetting is looking for aquatic macroinvertebrates under water. There are some incredible creatures luring along the edges of ponds and lakes if you're willing to look. Professional dip nets are fairly expensive at around $90. We've found that a Bait Well net such as the one on the left is a very affordable alternative. You'll be amazed to discover dragonfly nymphs, predacious diving beetles, fairy shrimp and more. Dads who fish will especially like this high tech wildlife espionage gadget. We use a similar unit where I work and people are always amazed to see all of the fish that are hiding just under the surface of the water. These units are especially fun to lower down into a frozen lake. The black and white camera comes with 60 feet of cable and it lights up underwater so it can even be used at night or in the dark depths of a lake. The unit comes with the video monitor and battery. At the nature center where I work, we use special professional grade equipment to teach kids about radio telemetry. We track rare Blandings turtles as they move around the property. You can try out a similar technology at home without the very high start-up costs involved in professional equipment. Loc8tor makes this starter kit that is supposed to be used to find things like your car keys. Have fun playing wildlife researcher by attaching it to you child's stuffed wolf and hiding it. This is the ultimate high tech hide and seek game. When you're done playing, attach it to your keys and never lose them again. Similar to the game trail camera above, the wingscapes camera is specially designed to capture birds. It can take both still images and video. These are especially fun as you can see who'e visiting your feeder when you aren't home. The Bat Detector, available for Acorn Naturalists is one of the coolest little devices I've come across. It detects ultrasonic frequency sound waves and lowers them into the range of human hearing. The device is a little on the pricey side. Each unit is hand made, not mass produced which accounts for some of the cost. Those handy with electronics can find directions online to make your own.